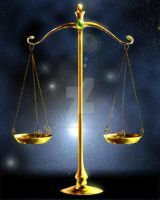 the scales are for Libra which I am, the horse head for my name the scorpion for my family which is mostly full of scorpio's, the ying-yang symbol is my belief in balance, and it is on my left side cause I am left handed. Awesome! Nothing beats a tattoo with meaning behind it. Absolutely love it! Nothing beats original designs, and this one is done so well!